thank you for your support at the 10th annual governor’s luncheon! Marta Codina is a 39-year veteran of the financial services industry who started her career as a teller during high school in Houston, Texas. Marta moved to Iowa in 1992 to join US Bank and worked there for 10 years as a regional manager leading the Retail Banking Division. She joined Wells Fargo in 2001. During her tenure with the company she has served as a regional development manager, overseeing leadership strategies and learning and development for Iowa, and as an area manager for Wells Fargo Home Mortgage, overseeing the mortgage production sales force for Iowa, prior to working in Community Banking. 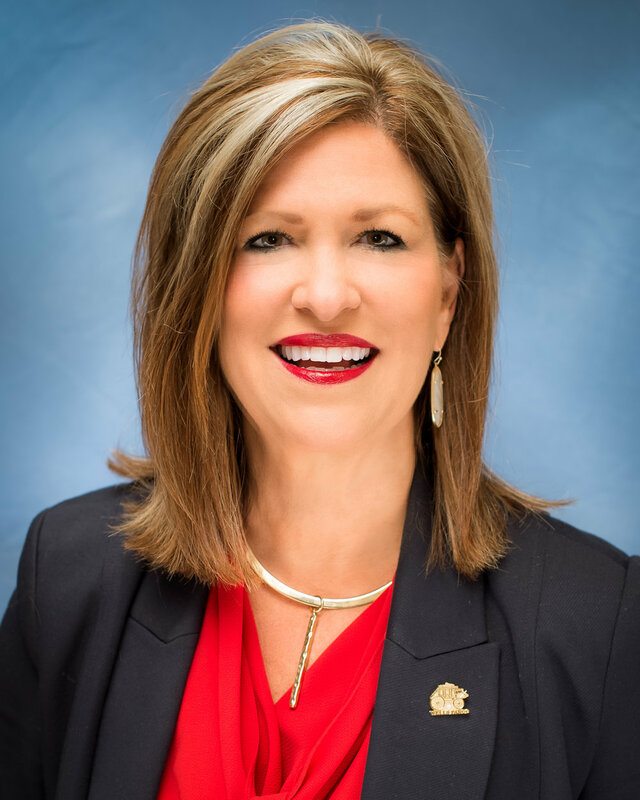 Marta currently serves as region bank president for Wells Fargo Bank. In her role she oversees western Iowa retail banking in a territory that includes Des Moines, Ames, Atlantic, Waterloo/Cedar Falls, Clarion, Denison, Eagle Grove, Emmetsburg, Fort Dodge, Jefferson, Mason City, Perry and Sioux City. A graduate of the University of Houston, she was a founding member of the Wells Fargo Central Iowa Diversity and Inclusion Council and is an executive sponsor of that group, which coordinates Wells Fargo’s local efforts around diversity and inclusion. She is an active volunteer in the central Iowa community and serves on many nonprofit councils and committees, including as vice chair on the executive committee of the United Way of Central Iowa, the Greater Des Moines Partnership board, the Special Olympics Iowa board and on the National Advisory Council of The Robert D. and Billie Ray Center (formerly known as Character Counts in Iowa). Marta and her husband, Jim Bruno, are residents of Waukee, Iowa, and have a son, Nicholas, and daughter, Maddie. Marta is a native of Cuba and came to the United States as a refugee in the early 1960s with her parents. Her passion is around “making a difference” primarily in the areas of early childhood development and diversity and inclusion. Mary Mack leads Consumer Banking for Wells Fargo and oversees approximately 107,000 team members. Consumer Banking includes Regional Banking; the Customer Segments Group, which serves Small Business, Affluent, Wells Fargo At WorkSM, Personal Lending and Practice Finance customers; the Customer and Branch Experience Group; the Strategy and Administration Group; the Regional Services Group; the Distribution Strategies Group; Home Lending; Consumer Control; and Wells Fargo Auto. Consumer Banking provides financial services to 21 million retail households and three million small business owners through approximately 5,500 retail branches and more than 13,000 ATMs in 36 states and the District of Columbia. It also provides home and auto lending to nearly 11 million households nationwide. Mary began her career with Wells Fargo in 1984 and has a broad mix of brokerage/advisory, banking and finance experience. She most recently held the position of President and Head of Wells Fargo Advisors, LLC, one of the nation’s largest full-service retail brokerage organizations. Prior to that, Mary led the Financial Services Group and was responsible for investment, advisory and banking products; the firm’s research and advice model; Financial Advisor (FA) recruiting, FA productivity and development and the client and FA platform. Over her 34-year tenure with Wells Fargo, Mary also held a variety of leadership positions including the head of Wealth Brokerage Services; leader of Wachovia’s Client Partnership; director of Community Affairs; General Bank regional president; and managing director of Healthcare Corporate Banking. A graduate of Davidson College in North Carolina with a bachelor’s degree in International Political Economy, Mary also serves on the college’s board of trustees. She is a member of United Way Worldwide’s Board of Trustees, a board member of Habitat for Humanity International, a member of the Charlotte Executive Leadership Council, a past member of Civic Progress St. Louis, and past co-chair of the St. Louis Regional Chamber’s Financial Forum. She also served on the executive committee of the United Way of Greater St. Louis, the board or executive committee for Johnson C. Smith University, the United Way of Central Carolinas, Junior Achievement, Childcare Resources, and the Arts & Science Council. She is also a founding member of the Foundation for Fort Mill Schools. Mary was named by Fortune magazine as one of the “50 Most Powerful Women in Business” for 2016, 2017 and 2018. American Banker magazine ranked Mary #1 in their 2017 and 2018 “25 Women to Watch” listing and named her among the “25 Most Powerful Women in Finance” for 2014 and 2015. She also ranked among the top 20 “Women to Watch” in financial services by Investment News in 2015. Grace Peck is 13 years old and resides in Des Moines, Iowa, attending Saydel schools. She didn’t discover Girl Scouts until 4th grade but hasn’t wasted any time getting up to speed! As a Cadette Girl Scout, Grace has been the top cookie seller in her troop for several years, having sold more than 5,000 to date! Cautious by nature, Grace credits Girl Scouts for helping her stretch her physical limitations, including recent activities like rock climbing, a high ropes course, zip lining and sail boating for the first time. In addition to Girl Scouts, Grace enjoys a wide range of activities. As an 8th grader, Grace stretches herself academically by taking high school math courses, and enjoys the title of “Fast on Facts” champion. She’s also a member of her school’s mock trial team and recently received the distinction of Outstanding Attorney by the Iowa Bar Association. With a passion for community service, Grace and a classmate recently created the school’s first ever Environmental Club. She balances that with participation in drama club, choir, select honor choir and student council. If you’re lucky, you can even catch Grace doing stand-up comedy at various school functions. Grace also has a love of sports, participating in basketball, volleyball, softball and tennis. She was recently selected to join a traveling Tournament Volleyball Team and loves the thrill of competition. Carter attends Waukee Prairieview as a Freshman and is an Ambassador member of his school’s student leadership team. He has been involved in Scouts BSA for over half his life and is currently a member of Troop 316. After attending an Eagle Scout Court of Honor when he was a 7-year old Tiger Scout, he declared to his parents that he was going to be an Eagle Scout. His determination, focus, and hard work has served him well in his Scouts BSA career. Carter was invited to join the Order of the Arrow, which recognizes Scouts BSA who best exemplify the Scout BSA Oath and Law in their daily lives. Carter completed his Ordeal and joined the Mitigwa Lodge Order of the Arrow in August 2017. September 2018, one day after his 15th birthday, Carter earned the highest Scouts BSA rank of Eagle. The esteemed status of Eagle Scout is only reached by approximately 4% of Boy Scout/Scouts BSA on average. Thus far, his favorite merit badges earned are climbing, camping, and wood carving. Carter also has a knack for selling Scouts BSA/Boy Scout popcorn. To date, Carter has sold $35,452 of popcorn in door-to-door sales. He loves reading, attending his church and youth group, traveling with his family, playing with his 3 pugs, and is a Lego and Star Wars aficionado. His career aspirations are divided between mechanical engineering and serving God in the missions’ field. He is also known to share a lot of puns and Dad jokes. Girl scouts of greater iowa and MId-iowa Council, boy scouts of america serve More than 40,000 youth. Communities in 67 Iowa counties benefit from the service projects led by Girl Scouts and Boy Scouts, two DISTINCT ORGANIZATIONS with More than 10,000 adult volunteer leaders who serve as mentors and guides. Over 1,700 acres of wilderness preserve are maintained by the two ORGANIZATIONS at six camps. Both organizations believe in the power of youth and tomorrow's leaders. For more information about Girl Scouts visit visit www.girlscoutsiowa.org and for more information about boy scouts of America, visit www.midiowacouncilbsa.org.